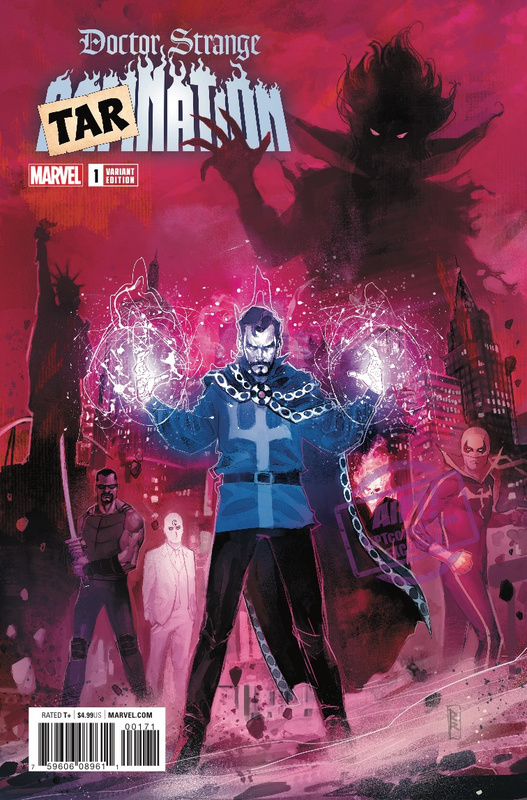 Doctor Strange: Damnation #1 Review – AiPT! Doctor Strange attempts to save Las Vegas. It doesn’t go well. Duh! Secret Empire continues to linger in my mind mostly because there were big story beats you can’t just erase. The story may have retconned Hydra Cap, but what about Ultron Hank Pym, or the destruction of Las Vegas? The latter question is why I had to pick up Doctor Strange: Damnation to see how Marvel was going to clean up the total annihilation of Las Vegas. The answer to that might surprise you. Donny Cates is one of the hottest writers right now. Just read my reviews of his recent Thanos series. The guy is filled with ideas and is lighting it up. Co-writer Nick Spencer is also a fantastic writer and his Captain America series was proof enough his psychological thriller chops are excellent. He’s teaming up with Rod Reis who is very good at turning out visceral and realistic looking comics which should look striking when he draws a proverbial Hell on Earth in this series. Make no mistake one of the reasons Cates is so damn good at writing is because he always manages to surprise the reader. This issue is filled with surprises and fun wrinkles in character work you won’t see coming. Take for instance his depiction of a now powered up Doctor Strange. He enters the Las Vegas scene with the main heroes somewhat defeated, but to him they’re just overly stressing a problem with an easy solution. A spell or two later and there’s a demonic looking skyscraper coming out of the Earth like it came from Hell itself. And I think it did. Mephisto ends up being a major character in this story and his depiction of a Hell Las Vegas is quite entertaining. Watch as people burn alive sleeping with hookers, or boxers turn into demons in the ring launching their opponents. It’s fun to see how Cates shows how boring torturing can be, but how the city of sin can flip everything around. Rod Reis draws a solid issue with some imaginative flourishes with layout design. In a flashback scene, for instance, Mephisto explains how bored he was in Hell and each panel is a strip of black and white film. 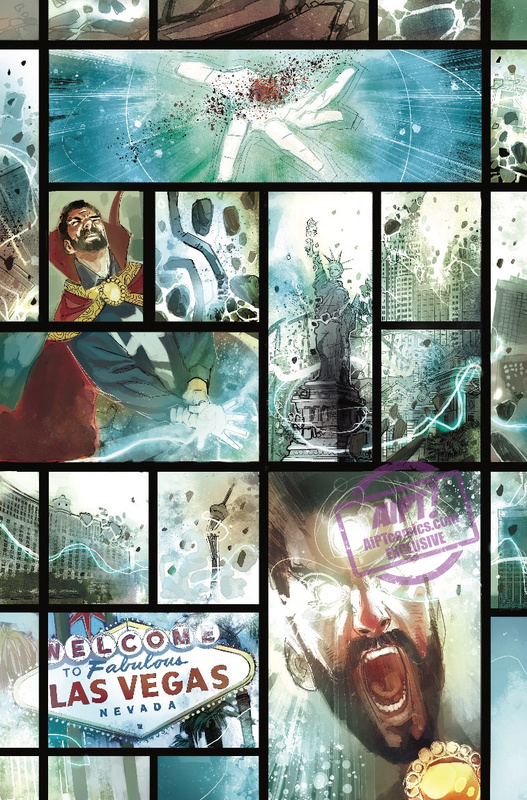 In another we see Doctor Strange heal Las Vegas in an interconnected layout like one might see in an Instagram photo montage. Mephisto looks excellent–like something out of Legend–and the Ghost Rider is strong with this comic. Seriously, Ghost Rider fans, read this! Did he just raise the dead? Mephisto’s postulating to Doctor Strange grows a bit tiring. 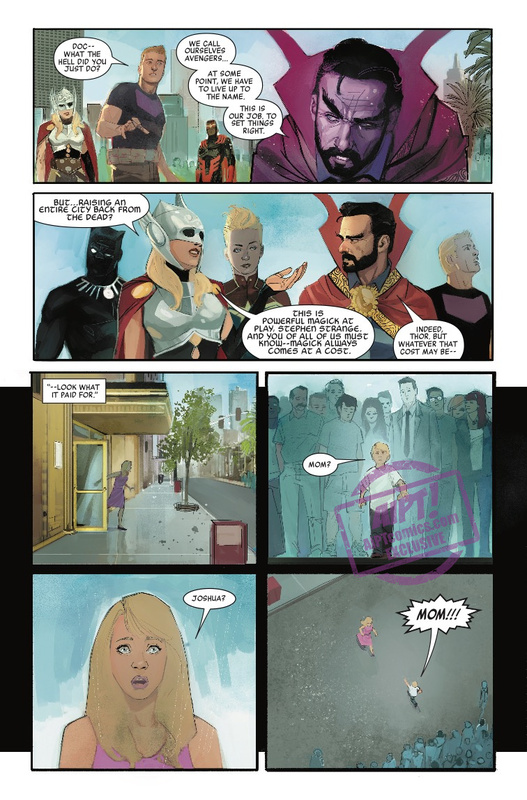 I’m not sure his explanations and reasonings can sustain the middle portion of the book, which becomes obvious when he offers Doctor Strange a deal near the end and even Doctor Strange is tired with his speech. This sequence takes up 11 pages of the comic and will run your patience. The last few pages redeem the comic and will make you want more–it’s badass and a very surprising twist–but it’s still a cause for concern. Fans of comic book supernatural storytelling heed my words, you will love this! Mix demons, Las Vegas, Marvel’s literal devil, and a promise for a superhero team-up you’ve never seen add up to a great kick start to a fun four-parter. An entertaining opening issue with clever ideas albeit it does drag a bit in the middle.